Christian Krohg (1852–1925), The Struggle for Existence (1889), oil on canvas, 300 x 225 cm, Nasjonalgalleriet, Oslo, Norway. Wikimedia Commons. In the autumn of 1888, Christian Krohg married Oda Engelhardt, his former pupil, in Oslo. Although their relationship appears to have been open, and quite stormy at times, Krohg now had a partner and a family to paint. 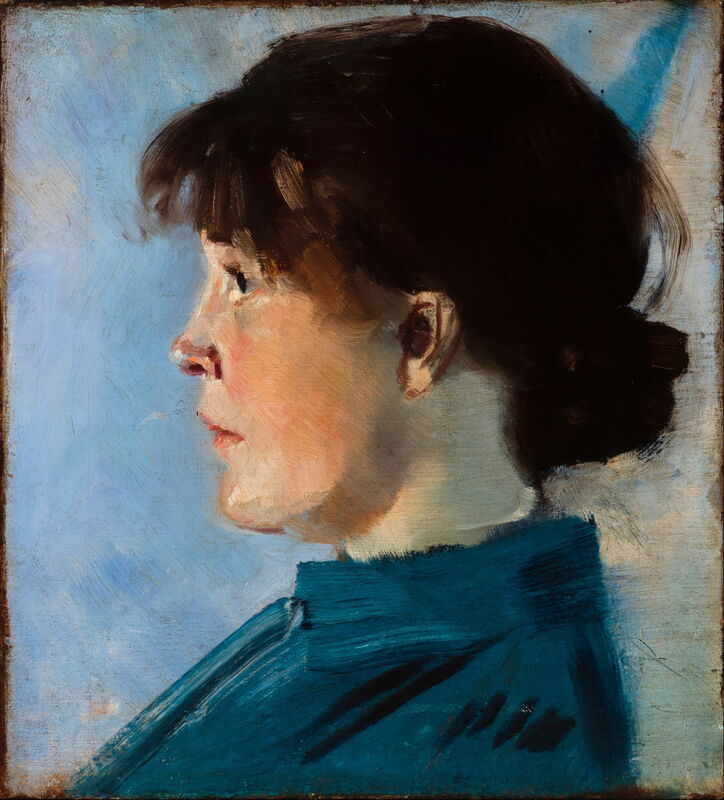 Christian Krohg (1852–1925), Oda Krohg (1888), 34 x 31 cm, Skagens Museum, Skagen, Denmark. Wikimedia Commons. In the summer of 1888, the Krohgs went to Skagen in Denmark, where he painted Oda Krohg (1888). Although not quite as clinical as his portraits of the Gaihede family, he uses the same profile pose, the subject looking straight ahead, as if in an identity photograph. That contrasts with his very informal and sketchy facture. Christian Krohg (1852–1925), Portrait of the Painter Oda Krohg, née Lasson (1888), oil on canvas, 86 x 69 cm, Nasjonalgalleriet, Oslo, Norway. Wikimedia Commons. Krohg’s three-quarter length Portrait of the Painter Oda Krohg, née Lasson (1888) is a marked contrast. Although still quite formal in its composition, Oda is here shown in her role as a ‘princess of the Bohemians’, which sadly came to overshadow her own art. Over this period, Krohg had been working on his next major painting, The Struggle for Existence (also translated as The Struggle for Survival) (1889). 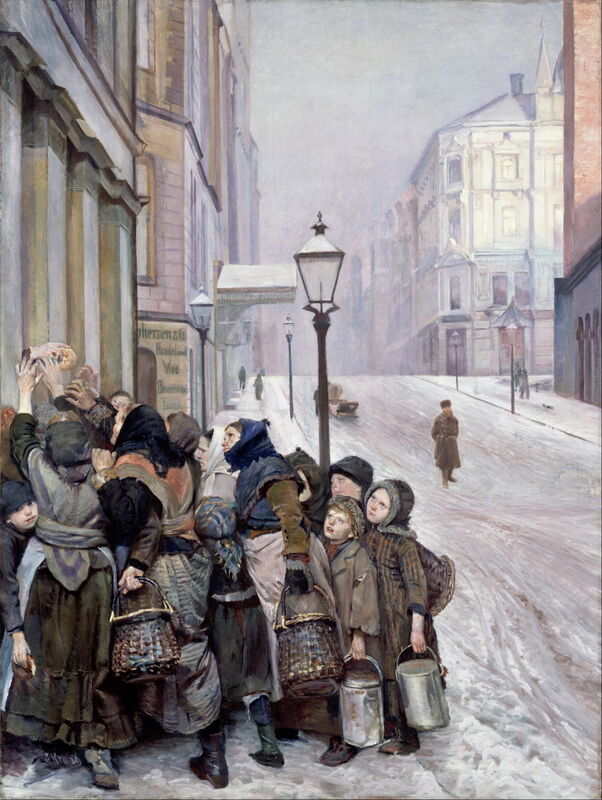 It shows Karl Johan Street in Oslo in the depths of winter, almost deserted except for a tight-packed crowd of poor women and children queuing for free bread. This was Oslo’s main street at the time, and three years later was to be the setting for Edvard Munch’s famous painting of Evening on Karl Johan Street. The people are wrapped up in patched and tatty clothing, clutching baskets and other containers in which to put the food. A disembodied hand is passing a single bread roll out to them, from within the pillars at the left edge. That was yesterday’s bread; now stale, the baker is giving it away only because he cannot sell it. A policeman, wearing a heavy coat and fur hat, walks in the distance, down the middle of the icy street, detached from the scene. On this pessimistic note, Krohg’s ‘naturalism’ or social realism came to an end. Christian Krohg (1852–1925), In the Bathtub (1889), oil on canvas, dimensions not known, Bergen Kunstmuseum, Bergen, Norway. Wikimedia Commons. The Krohgs spent the summer of 1889 not at Skagen, but in the coastal resort of Åsgårdstrand, about sixty miles (100 km) south of Oslo. Nearly ten years later, Edvard Munch was to buy a summer house here. The Krohgs’ son Per, their second child, was born there that summer, and was almost certainly the model for In the Bathtub (1889). This shows the near-ceremonial surrounding the bathing of a newborn baby, with the mother and women relatives providing endless advice, even taking the event over. In the autumn, the family (I think) travelled to Copenhagen, Denmark, where they lived until early summer of 1890. From there, they made a short visit to France, where Krohg was awarded a bronze medal at the Exposition Universelle in Paris. 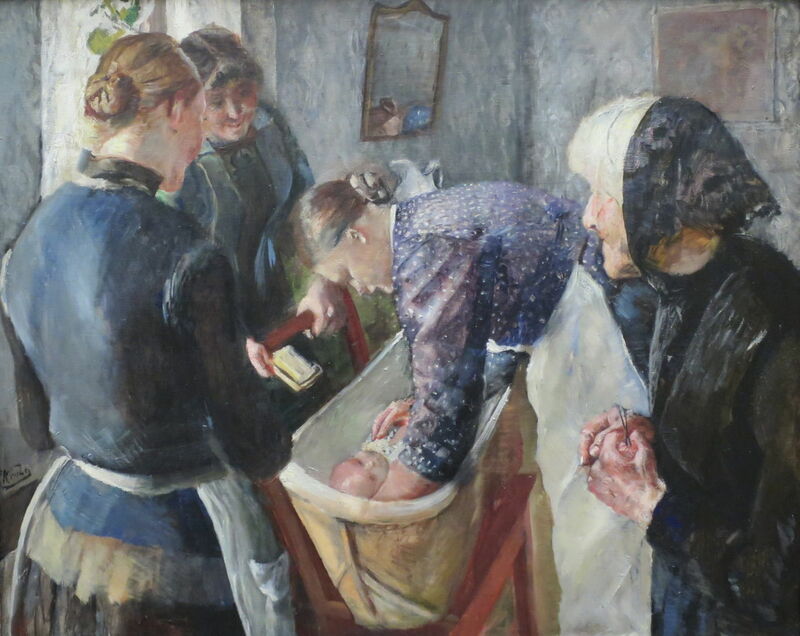 At this time, Krohg was working as a journalist, and teaching, particularly at the school run by Harriet Backer. Christian Krohg (1852–1925), View over Frederiksberg, Copenhagen (1890), oil on canvas, 56 x 56.5 cm, Nasjonalgalleriet (gift of Olaf Schou 1909), Oslo, Norway. Courtesy of Nasjonalmuseet, Oslo. 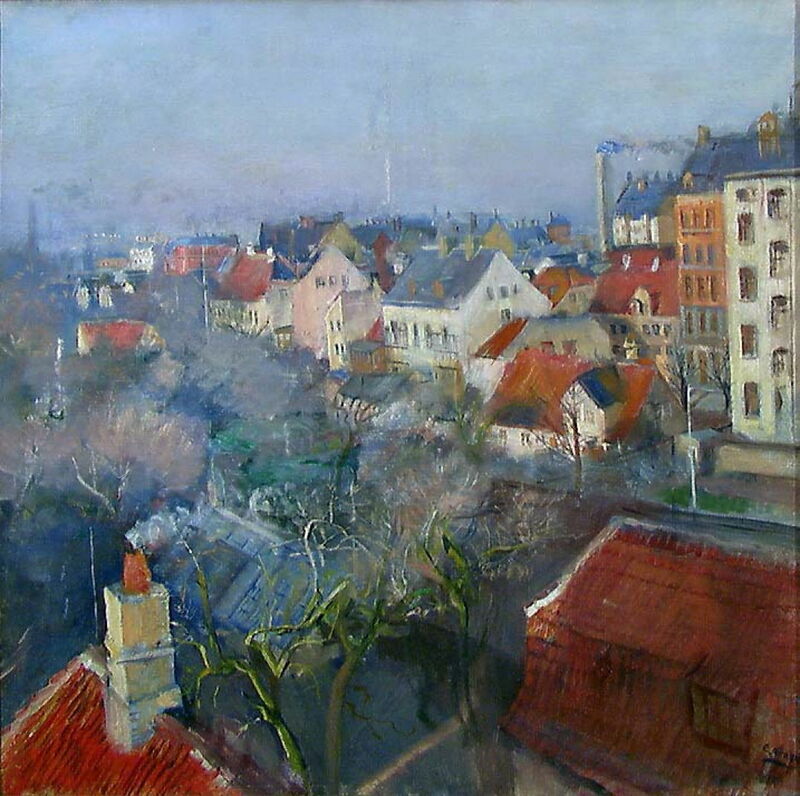 When he was living in Copenhagen, Krohg painted one of his few works in Impressionist style, View over Frederiksberg, Copenhagen (1890). He was exploring where to go next, and although an evocative view, I think he was correct in not pursuing landscapes. 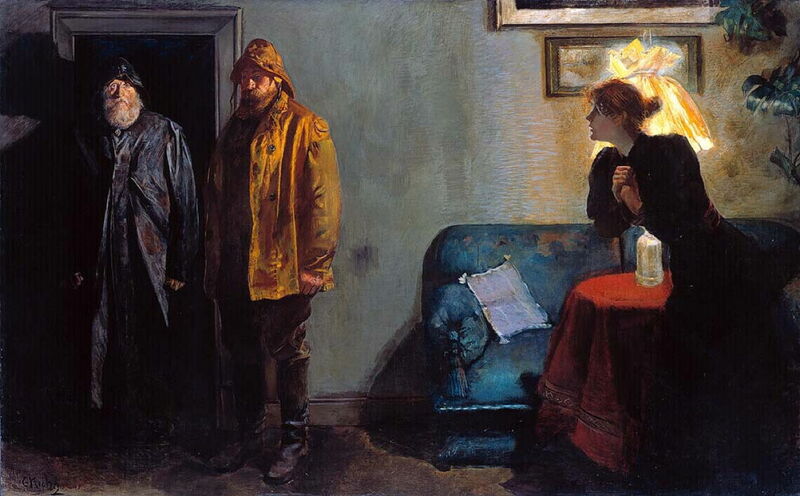 Christian Krohg (1852–1925), Leiv Eirikson Discovering America (1893), oil on canvas, 313 x 470 cm, Nasjonalgalleriet, Oslo, Norway. Wikimedia Commons. Instead, Krohg painted some history of contemporary relevance. 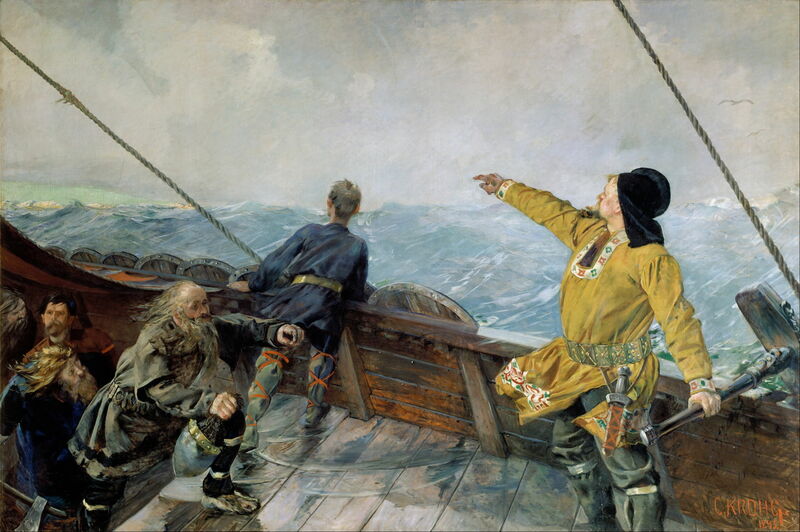 Returning to his seafaring theme, his next successful work was a period drama dear to the Nordic heart: Leiv Eirikson Discovering America (1893). Leif Erikson (or any variation of spelling) was Nordic, probably one of the Norse inhabitants of Iceland between about 970-1020. The son of Erik the Red, who colonised Greenland, Leif visited Norway in about 999, and according to the Icelandic Sagas went on later to discover Newfoundland in Canada. When Krohg painted this, no archaeological evidence had been discovered to support the sagas, though – that followed in 1960. 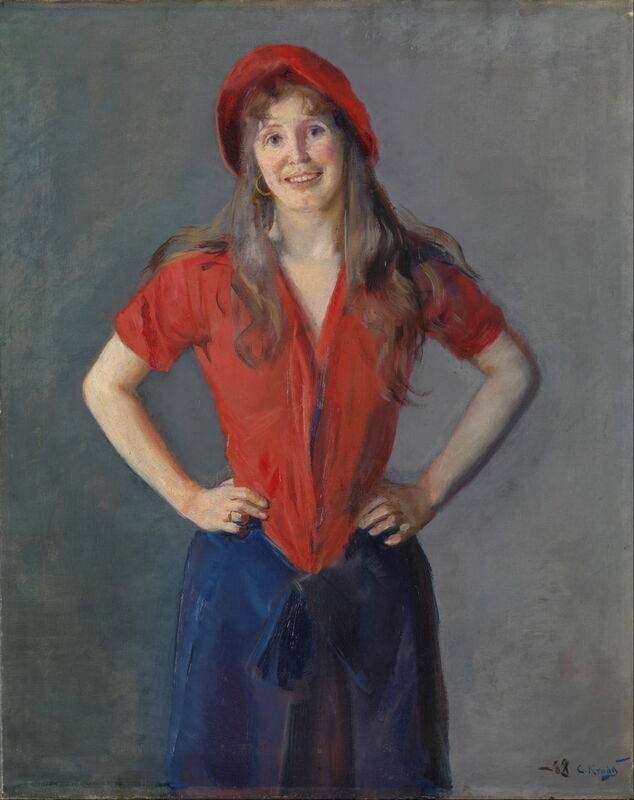 Krohg’s choice of motif drew on growing contemporary desire for complete independence of Norway from Sweden, and referred to the many Norwegians who had migrated to a better life in the US. Christian Krohg (1852–1925), 17th of May 1893 (c 1893), further details not known. Wikimedia Commons. Probably painted in the same year, Krohg’s 17th of May 1893 was an even bolder statement about Norway’s nationhood. The seventeenth of May had been increasingly celebrated as Constitution Day since the signing of the national constitution in 1814. 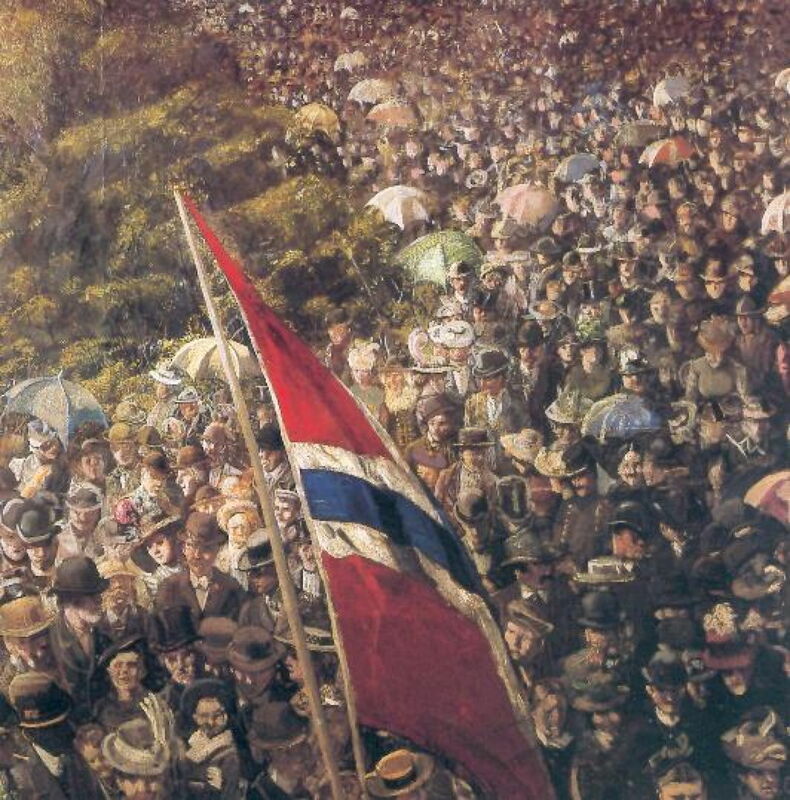 Not only is this painting full of the Norwegian people, but the Norwegian flag shown lacks the ‘herring salad’ badge marking the union of Norway with Sweden – a clear sign of Krohg’s feelings about independence. From the autumn of 1893, Krohg was away from home almost constantly. He first went to Copenhagen, then on to Berlin and Paris. He stayed in Skagen for his last summer there in 1894, before returning to Oslo. In 1895, Krohg painted one of his more enigmatic works, a throwback to his social narratives, and something of a ‘problem painting’: Eyewitnesses. It is nighttime in a living room. Two fishermen stand in front of a door. Still wearing their soaked and soiled oilskins, they appear to have entered the room straight after coming ashore from the sea. One stares in shock towards the viewer, the other looks down and away. Both appear full of unease, silent and immobile. At the right, a young woman is standing, leaning forward towards the men, as if listening to them. She looks anxious, with her hands clasped in front of her chest. Behind her an oil lamp burns brightly, there are the leaves of a large potted plant, and a couple of paintings on the wall behind a large blue settee. One possible reading is that the men have brought news of the loss at sea of the woman’s husband, an event of which they were eyewitnesses. In the coming years, Krohg was to return to the sea in his paintings. Posted in General, Life, Painting and tagged Krohg, Munch, naturalism, Norway, painting, realism, Skagen. Bookmark the permalink.